Successfully Added 6-in-1 Multifunction Mini Digital Altimeter + Compass, Weather to your Shopping Cart. Don’t pack for your next adventure without it. Introducing the OG10 6-in-1 Multifunction Mini Digital Altimeter. Altitude: Range from -2,295 to 29,500 ft. Meter and Foot switchable, absolute sea level and relative altitude measurements. Maximum altitude history record and sea level setting. Barometric pressure: Measure atmospheric pressure from 300mbar to 1100mbar . Direction: High accuracy digital compass. Never lose your direction again. Weather: 12-to-24-hour forecast indicating sunny, slightly sunny, cloudy or rainy weather conditions. Temperature: Thermometer from -10C to +60C. Celsius and Fahrenheit switchable. Time: Quick and convenient access to time with hour, minute and seconds . If you enjoy the great outdoors or are simply planning your next adventure then the OG10 is the must-have outdoors accessory for you. Order now and we’ll express ship your new multifunction altimeter and even include our full one year warranty. Multifunction altimeter with barometer, compass, weather, temperature and time. Compact and convenient clip-on design with backlit LCD for use in outdoor areas. Comes with full one year warranty. 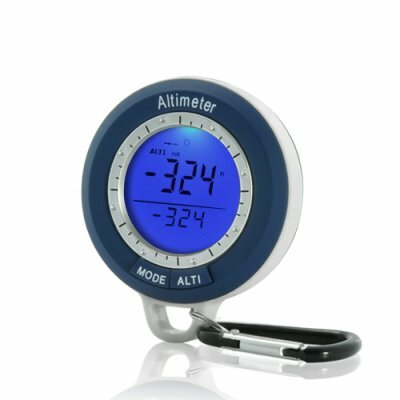 Please consider ordering your sample now because in 60 days this product will be a 3 MOQ (minimum order quantity) item. .
Altimeters are often misunderstood because they do not measure your actual position on the earth (true altitude) such as a GPS, but measure the air pressure and predict the altitude based on this measurement. This is referred to as "Pressure Altitude". Pressure Altitude is profoundly affected by the true altitude and to a lesser extent, changes in the weather, often referred to as barometric pressure changes. Thus, your Pressure Altitude can change without changing your position. These changes can be as great as a few hundred feet (the changes due to weather are more pronounced at higher altitude). To offset the difference between Pressure Altitude and True Altitude, you must calibrate the device at a known altitude, whenever convenient.